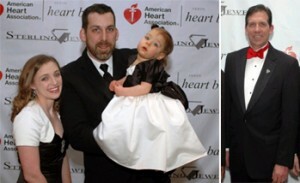 A few months ago a representative from the American Heart Association called to let us know that Dr. Philip Smith, who along with Dr. Spector, performed Bekah’s open heart surgery, was being honored as a “Heart Champion” at the Akron Heart Ball. We weren’t surprised at all since we absolutely LOVE Dr. Smith. We were, however, surprised when we were asked to help by working with GO2 Advertising (they received a Heart Award too, for their work with the AHA) to create a video clip about our time with Dr. Smith. We were even more surprised when they asked us to speak about pediatric cardiovascular research. We spent hours trying to decide how to best convey how pediatric cardiovascular research has impacted our lives. Saturday night, as the live auction drew to a close and our section of the program drew near, Dr. Clark introduced us to the crowd, and we hoped that our simple words could in some way help to show those who heard them just how much donating to heart research really means to those who benefit from improved practices and progress in medicine. Chris and I are very aware that Bekah’s open heart surgery was a fairly easy one. 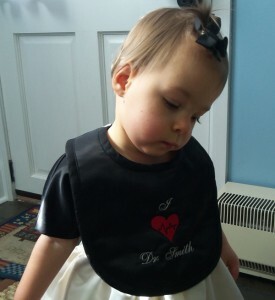 While we don’t take her heart surgery (no matter how routine) lightly, we also know that there are many, many families who are not as lucky as we are. According to AHA research, 9 out of every 1,000 babies born have some sort of congenital heart defect. While most of them are mild, others are so serious that surgery (or even a sequence of surgeries) is not an option and instead palliative care measures must be taken to make the baby more comfortable. While we enjoyed our evening at the Heart Ball, we also enjoy every single day with Bekah thanks to years of pediatric cardiovascular research, and our very own Heart Champion, Dr. Smith.